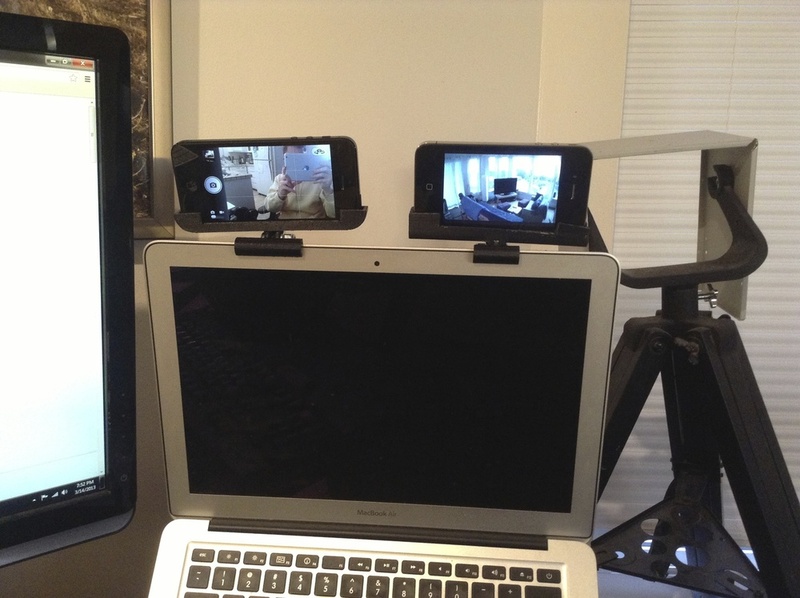 HoldmyiPhone started out as the solution to a very specific problem: my friend, an accountant, needed to free up valuable workspace when working from his laptop. His firm gave each accountant a 12-inch USB external monitor but its folding case + triangular stand was cumbersome. Together, the combo took up more desk space than a binder! Our concepts precariously mounted the 12-inch LCD above the laptop screen. As you can see, these creations were bulky and unattractive. The size of LCD Panels simply makes them impractical to perch above a laptop. This realization spawned the idea to refocus on a much more common display than 12-inch LCDs. The answer was right in my pocket: the iPhone. Over the next seven months, the product evolved from a variety of laptop mounts to a much more universally useful product that allows you to tilt your iPhone on a table. The first iteration of the HoldmyiPhone now featured in cuddle burrito’s shop made its debut on Etsy in September. Prototyping the product was just the first step. Next came the long and tough iterative process, which taught us a lot about making the best prints possible -- lessons which I can now share with you. Off the bat, we invested in a glass with Kapton tape print platform. This seemed like the surest path to the smooth reflective surfaces we envisioned for the product. While we were right about that, we had no idea just how many challenges this platform would pose. Sometimes it feels like there are a million of things that could go wrong with glass printing -- everything from bubbles underneath Kapton tape to an un even print bed. But even if you avoid those, you’ll still likely run into a problem involving warping. ABS is a thermoplastic that shrinks as it cools. Without first brushing on an ABS+Acetone slurry (which helps keep the print adhering to the build platform), the finished print warps wildly out of tolerance or even causes the print to fail entirely. ABS/Acetone slurries solve the problem but at the cost of marring the surface with leftover slurry residue. If you can imagine gluing paper to cardboard and pulling it apart, you’re basically imagining slurry residue. The solution was to add 0.3mm "lily pads" to the prints. After the printer outlines the first layer, we brush slurry at the lily pad locations. Now, with the ABS directly on the Kapton tape, except for a few strategic points, the surface is free from residue. And with a nice flat foundation, subsequent layers have a better chance to fuse properly. This ends in a stronger and more aesthetically pleasing print. Take a look a this video to see what we mean. With new confidence in our ability to reduce warp, we hit a new problem: tangles. These tangles were tight enough to hold the spool fixed and get pulled off the spindle by the filament intake motor. It then reached a point where the motor slipped but the printer continued printing and nothing would come out. Again, we iterated through a few ideas (You’ll notice this is a theme here). Eventually, we ended up with a Raspberry Pi that tweets @cudbur_printer when the spindle lifts off an arcade button. This instantly pushes a notification to my phone, which warns me to manually reduce the tension. Being able to walk away from a complex print job with peace of mind is invaluable. But we know we still need to address the tangle problem at some point. We're not looking forward to that but once the problem is solved, you’ll be the first to know. 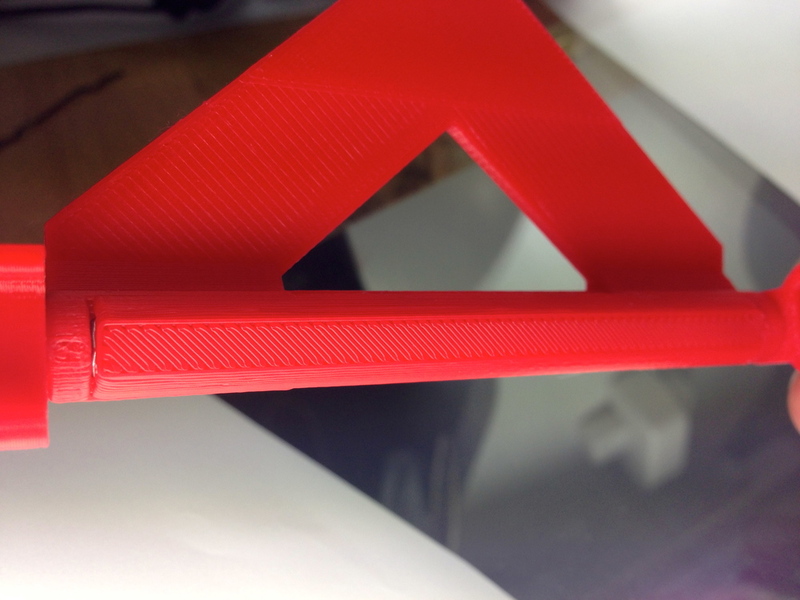 Through a combination of sensor feedback and designed-for-manufacturing iteration, Fused Filament Fabrication 3D printing can output high quality, strong, and functional products. (As you can tell, I’m a big fan.) Thanks to FFF printing, HoldmyiPhone boasts many unique strengths, including just-in-time manufacturing and infinite customization. It’s one of the ways cuddleburrito showcases a powerful new freedom to solve problems with 3D printing at its heart. HoldmyiPhone evolved from an accoutant’s specialized gizmo to a hands-free iPhone holder that anyone can use. Be sure to leave a comment! Thanks for reading and come visit us again soon. Created by an artist, powered by 3D printing. The future is now.